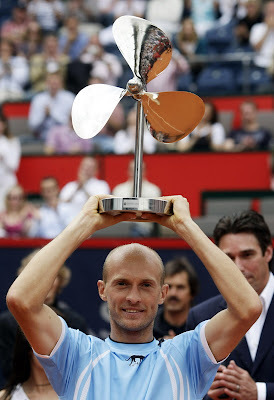 Davydenko beat Mathieu to win Hamburg, first title of the year for the Russian and finally back into the top ten. Exactly why was he given a propeller for a trophy though? Safina beat Errani (just) to win Portotoz, Ginepri beat Querrey to win Indianapolis and first time winner Petkovic beat first time finalist Olaru in Bad Gastein.